Man! Reeperbahn Festival is nuts – boozy boozy bar nuts! We had a really fun time catching up with a lot of friends at the 6th Flatstock Europe (a very well established and colourful gigposter fair which is held at the festival each year) and we met plenty more fun, inspiring or just plain bonkers gigposter artists from all over Europe and the other side of the Atlantic… The Petting Zoo team split and lost one another countless times and there were more than a couple of hungover mornings – but what a giggle! Fingers crossed, we will have our first stall at Flatstock Europe 7 next year… should be an adventure! We saw numerous excellent bands – there’s one very special outfit that we made contact with and intend doing some posters for, more on that soon! 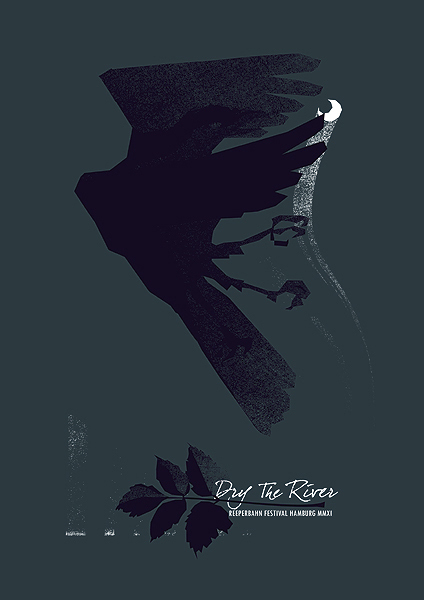 – but this post is dedicated to the excellent Dry The River! …goosepimples and hair upstanding, these guys played a set that frankly surprised us with its intensity – I reckon that even in this unstable time for the music biz, its a cert that these fellas are on the rise to something special. Do check them out live if you can. This entry was posted in Festivals, Gigposters, Screenprints and tagged band, dry the river, festival, gig, gigposter, hamburg, limited edition, petting zoo, print, reeperbahn festival, screenprint, serigraphy. Bookmark the permalink.